Is this the future of self-driving car? We live in a dramatic time. Technology is moving at an ever increasing pace and things we could only dream of are becoming real in a short timeframe. In our lifetimes we’ve seen the mass adoption of the internet and smart phones. What will happen in the next 50 years? What kind of impact will they have? What factors influence broad adoption of new technologies? When future archeologists excavate the year of 2030, what will they find? What are the objects that will surround us everyday, which will tell the tale of how we live, work, and play? 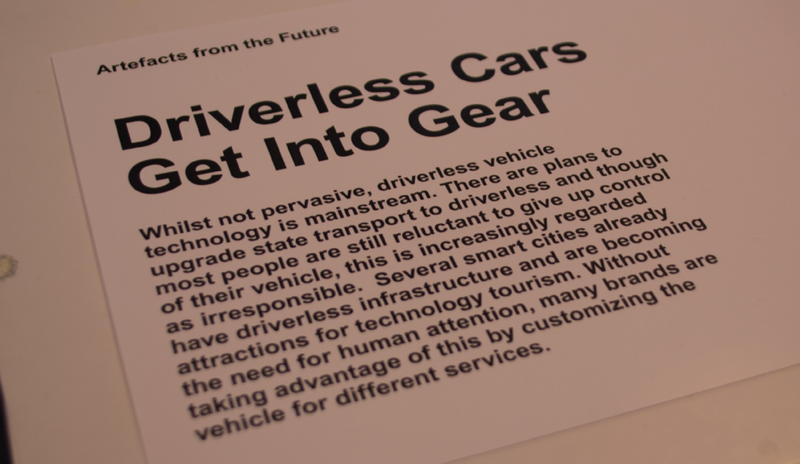 By thinking of the impact of self-driving vehicles and looking at user needs, we created a series of artefacts which could come from the future. The creation of ‘concrete’ artefacts helped us to appropriately consider this future world. 1.1 What currently happening in research centres? 1.2 How did we get there? The history of innovation has shown us the path towards innovation is never a straight line. What is the arc of innovation from idea to experience? 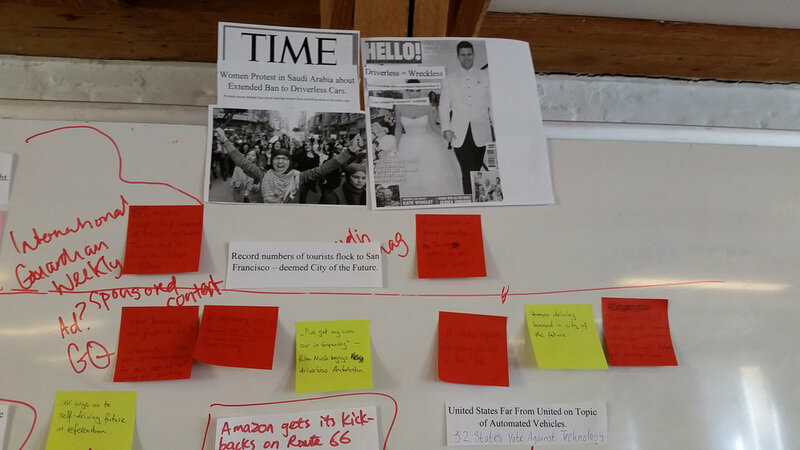 We can see the patterns from the past that will help us understand and determine the future. The development of autonomous car is accelerating as technology is getting more and more mature. 1.3 Who are the competitors in this market? Rate of Human Intervention: The number of times per mile that the company's test drivers need to take over the cars. 1.4 What people/industries might the technology disrupt? We first looked at what are the possible consequences, and then thought about who will be affected accordingly in what ways. Then we did some street research in Copenhagen in order to get the ideas such as how much parking space will be saved potentially, and what's the current level of automation for brands like Tesla. Understanding the deployment cycle of vehicle helps us to interpret how technology will be developed, but it's also essential to know how fast can people adopt new technology. Both of the research and the upper chart shows that the technology deployment cycle has been shortened. 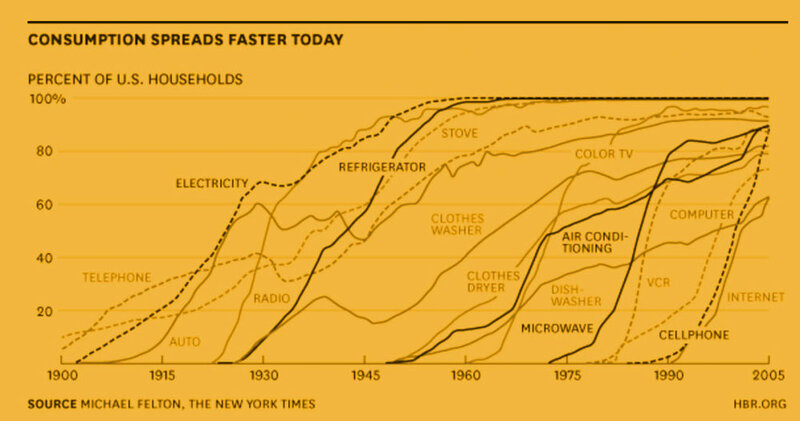 On the other hand, the bottom diagram shows us the technology adoption cycle has been steadily compressing. These explain why people say that 'one in four cars being self-driving by 2030' is conservative. 2.2 What contributes to technology success and failure? By analysing technology failures in the past, we are more clear about which factors enable the future (enablers) and which ones impede a technology's success (obstacles). Then we came up with 3 End States. 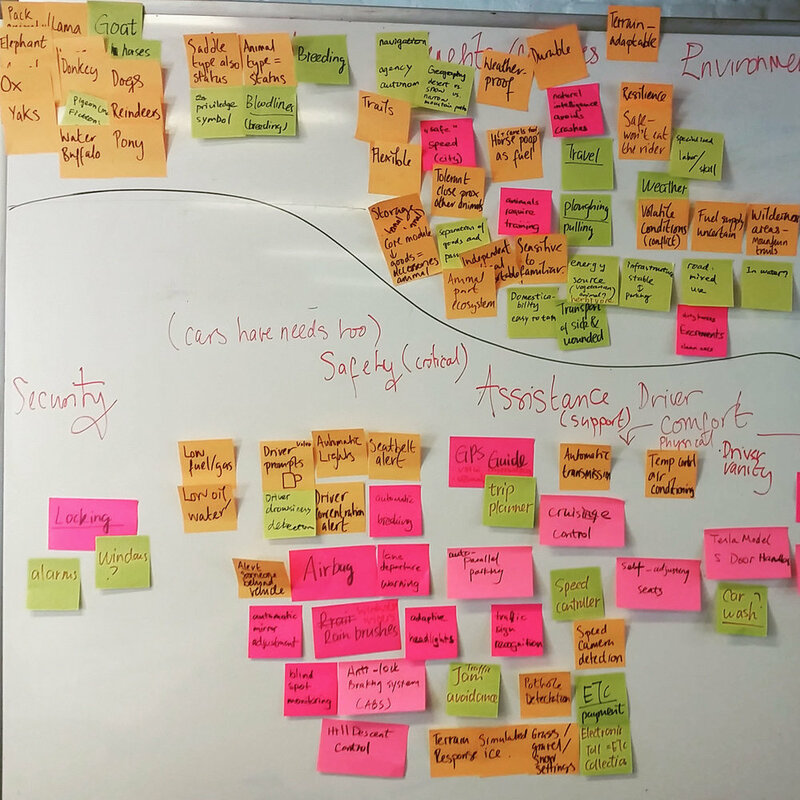 We brainstormed with post-its to furnish each statement with more detailed stories and analyse the possible enablers, obstacles, steps and implications. The first end state is possible, but it's more possible in the long term. The third end state seems not probable due to the study of recent trend. So we all agreed the second end state is more probable and hence more preferable in the near future. 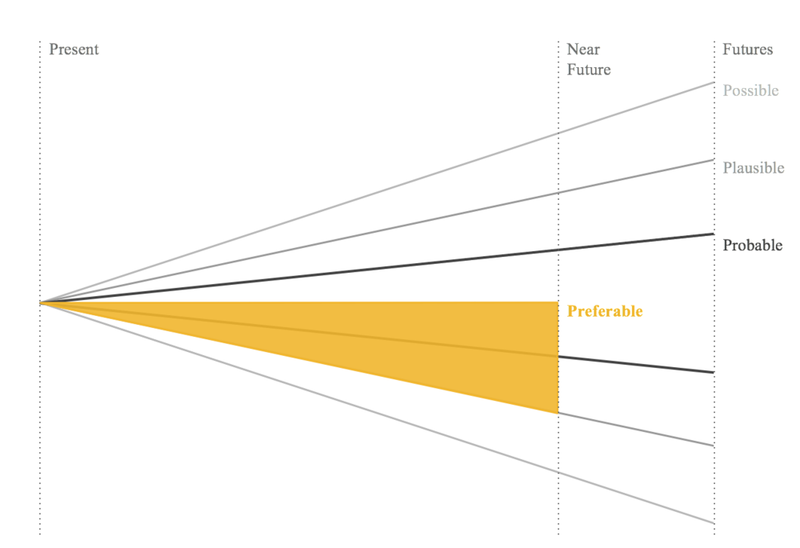 Based on the end state, we brainstormed about what's going to happen between now and 2050. When future archeologists excavate the year 2030, what will they find? In the era of self-driving vehicle, trees and people are able to reclaim previous parking spots. “Mobile Gym” service powered by self-driving vehicles, delivering your customized mini-gym to wherever you are. A celebrity passed away in a car accident. A human driving car crashed into her autonomous vehicle. This triggers heated debate about the coexis-tence of self-driving and human driving vehicles. Then California passes legislation requiring driver put on neon vest while vehicle is in human driving mode. 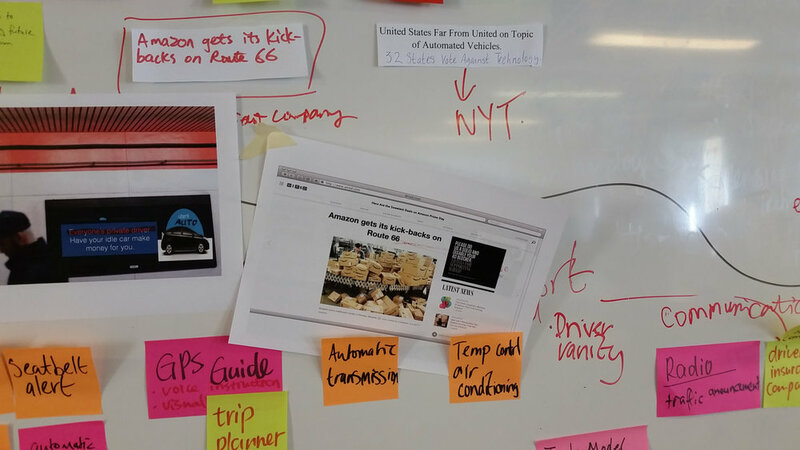 As designers, technologists, makers, our job is to create a tiny piece of the future. 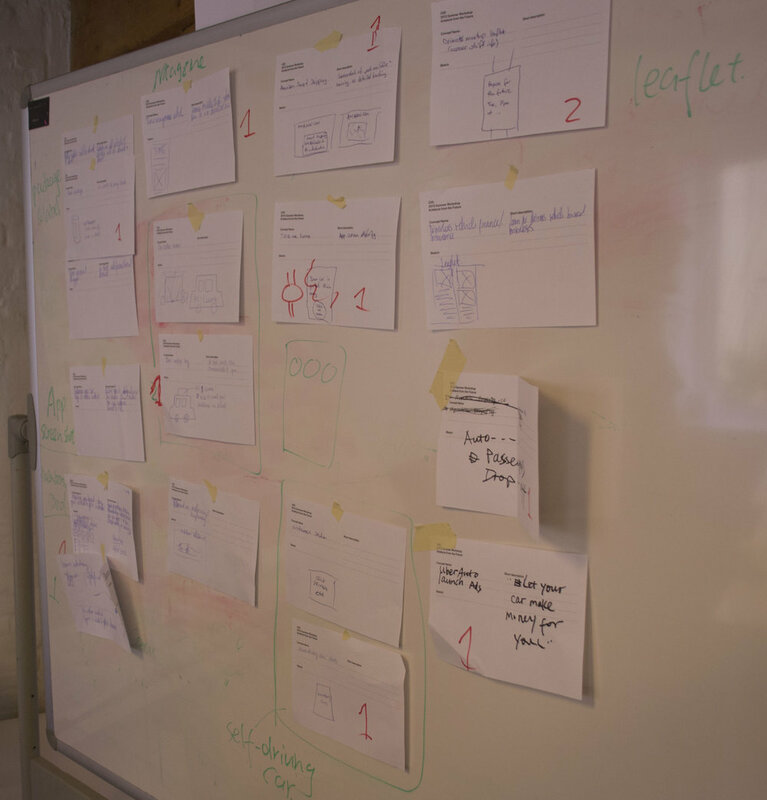 We stepped outside typical design constraints, and freed ourselves to think more critically about the future we want to build or want to avoid. In order to predict what's going to happen in future, we need to study history. But history doesn't help us making accurate predictions. It widens our horizons, makes us understand different possibilities, and hence lets us shape our own future.